S 8 PVT is designed for professional and industrial use. Size is similar to model S 17. S 8 PVT is mainly used in big animal buildings and industry buildings where dust makes the areas combustible. 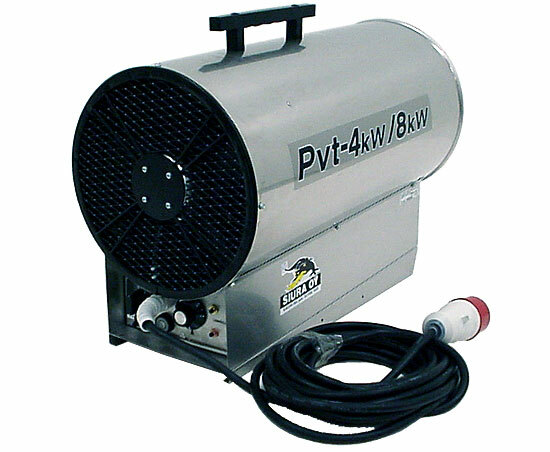 This model is also very popular for drying humid conditions in big cattle buildings by keeping the air moving effectively. Because of its big size and heavy weight (25 kg) the S 8 PVT should be set to a wall rack where it is easily pointed to different directions but does not have to be carried often to other places. Due to big amount of air flow compared to the heating power the PVT-heaters are effective for indoor use only. 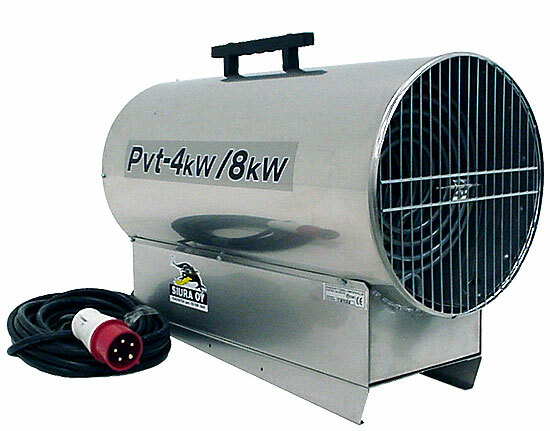 Large surface amount of heating elements and powerful fan compared to the power make all PVT-heaters very safe and reliable for dusty conditions. Power control switch on the left side of the the connecting cable. Switch position 0. When power is turned off the heater will cool itself and then stop. Switch position 1. Thermostat is now controlling the heater. When thermostat cuts the power off the fan will continue blowing until the heater cools down. After cooling the heat elements the fan will stop also. Switch position 2. Thermostat is now only controlling the heat elements but fan will keep blowing all the time. If the thermostat controller is set to off-position the heater can be used as a fan also. 2 overheat controller buttons on the right. (model equipped with 2 controllers set to opposite ends of the heater). Thermostat controller on the left of overheat controller buttons. Power start button under connecting cable. The fast spinning fan with ball bearing has very long operating life.